Facebook has this face recognition feature. It automatically recognizes faces in uploaded pics and then provided the option to tag the faces that its software has managed to recognize in those images. It is very successful most of the time. Face recognition is a very active field of research with many groups working on it. It is now part of security systems, the simplest example being laptops that have facial recognition feature for unlocking. Now, take a look at the image below. 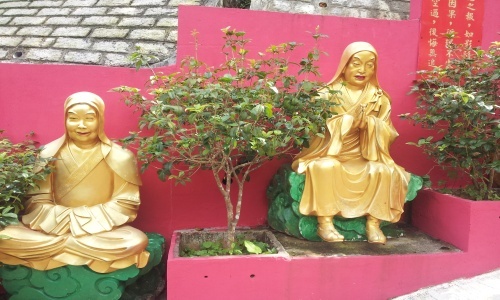 It shows two statues of Buddha at the 10,000 Buddha temple in Hong Kong. When it was uploaded to FB, the software identified the two faces in this photograph and asked for tags! It was quite a surprise for me and it made me realize a limitation with existing facial recognition technology. Existing technology cannot differentiate between real human faces or faces which are part of a “non-human” element. This is one reason why facial recognition technology is known to be fooled using images. One can login to a system by showing an image of the person with authorized access. This was discussed by USA Today here. This is also the reason why high security establishments may go for multi-modal authorization in which facial recognition is just one part. I guess for facial recognition technology to be truly a single point solution for authorization, it will have to learn to distinguish between human and non-human elements. The road ahead has a lot of interesting challenges!